AMTECH inside Rubber lined Diaphragm (also called membrane ) valve is recommended for application involving slurries, fluids with suspended solids, corrosive fluids etc. This valves provide tight shut off , primarily designed for on-off services. The Body material is CI, ,Sg iron ,CS Lined and Unlined both types are manufacture by us. 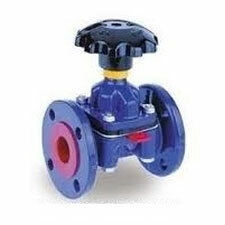 The Lined Diaphragm Valves are lined with Natural Rubber,Ebonite Rubber,Neoprene, Hypalon and customized rubber etc. we can do the Lining of other materials as per customer requirements. There are two types of diaphragm valves: first one type seals over a "weir" (saddle) and the other (also called a "straight-way" valve) seals over a seat. The saddle-type valve has its two ports in line with each other on the opposite sides of the valve, whereas the seat-type has the in/out ports located at a 90 degree angle from one another. The saddle type is the most common in process applications and the seat-type is more commonly used as a tank bottom valve. MATERIALCONTRUCTIONS ASTMA216 Gr WCB, CI TO IS 210 Gr.FG 220, AISI 304 (CF 8), AISI-316 (CF8 M), SS 316 L (A 351 CF 3C & CF3 M) unlined or lined. ENDCONNECTION FLANGEDASA 125# , 150#, Table- D, Table- E , PN ,6 10,PN 16, PN 40 ,DIN2533 , JIS ETC.